(CNN) -- Aging athletes don't have the agility they had in their youth. Minor injuries accumulate and become major ones. And by the time they hit their mid-30s and 40s, they're considered geriatric -- that's the conventional wisdom. 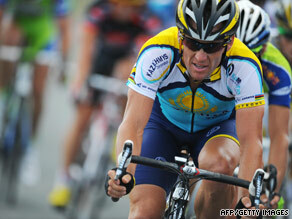 Cyclist Lance Armstrong is third in the Tour de France standings halfway through the cycling race. Even for non-elite athletes, research has shown steady physical activity is a fountain of youth. Activities such as walking, swimming, riding a bike, improve the heart and circulatory health, and reduce age-related muscle loss.